Ramesh Babu Reddy Department of Surgery, Krishna Mohan Medical College, Madhura, U.P. 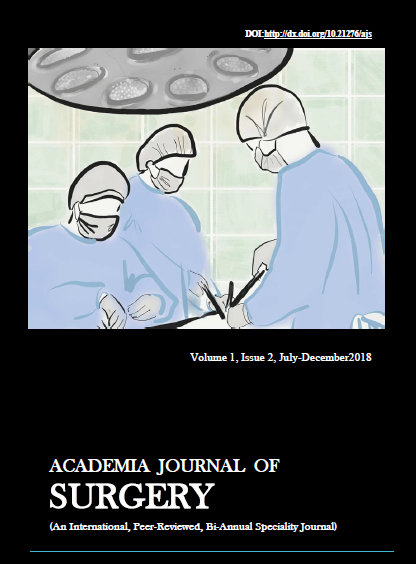 Background: Surgical emergencies are very common in surgical practise. Non-traumatic surgical emergencies include peritonitis, perforated appendix, strangulated hernias, urological conditions and some malignant conditions. These conditions are slowly increasing world-wide and especially in developing countries. And it is associated with high mortality and mobility because of non-availability of emergency surgical care. World-wide the mortality rate is ranges from 21.75% to 36.50%. Aim: To analyse the non-traumatic surgical emergencies and their outcome in rural India. Subjects and Methods:We have conducted this study in 1 year and we have examined 270 emergency case which were admitted in our hospital. The emergency care which were admitted in our hospital. The emergency cases which were due to traumatic haemorrhage and stab injuries were excluded from this study.Results:Out of total emergency cases 430, non-traumatic emergencies are 270. Age ranged between 20 year and 80 year. Out of 270 males were 155 and females were 115. The most common age group is 40-50 year.Conclusion: Facilities are inadequate in most of the part of the world and especially in developing countries like Africa, South Asian countries and in rural part of India. So there is need to improve rural and suburban health centres to reduce the morbidity and mortality in emergency surgical conditions. Ramesh Babu Reddy, Department of Surgery, Krishna Mohan Medical College, Madhura, U.P. Assistant Professor, Department of Surgery, Krishna Mohan Medical College, Madhura, U.P.